The PRIME (Physically Ready for Invigorating Movement Everyday) study was conducted at The Cooper Institute over a two year study period between January 1998 and January 2000. This study compared the dedication or adherence of two different groups to physical activity based on two different types of lifestyle activity intervention over six months. In the first group, participants attended group meetings and classes, received curriculum materials and homework assignments, were taught ways to incorporate moderate to vigorous physical activities into their daily routines, and were instructed to self monitor their physical activity. The second group received the same lifestyle materials as the first group as well as pedometers, an instrument which measures the number of steps taken by an individual, and forms to monitor their physical activity, but by mail and telephone rather than by face-to-face interactions. Further, each month a health educator called the participants to discuss their physical activity goals, physical activity level, and any associated problems faced. Both groups were further evaluated for participation in physical activity at a six month follow-up. In the PRIME study, we found participants in the second group who received all information via mail and telephone were more dedicated to physical activity participation than the first group. Although the second group received all materials and contact by mail and telephone, the participants did receive one-on-one personal interaction as a result. This personalized attention given to participants in the second group may explain why the second group was more dedicated to their physical activity program. Further, participants in the second group spoke individually with a health educator each month which allowed them to discuss their progress and goals and to receive feedback. However, those in the first group were not scheduled to discuss their program individually although the opportunity was available if requested. However, adherence and participation in the physical activity programs of both groups diminished over time as evidenced in Figures 1 and 2 above. 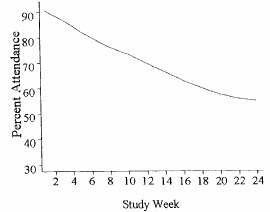 More specifically, the probability of attending class, completing the telephone calls, and completing the homework decreased significantly over the six month period. We also found that participants in both groups only self-monitored their physical activity 5-6 days per month. 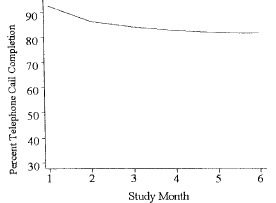 Further, throughout the duration of the study, participants in the first group were more likely than those in the second group to complete the homework. Within the first and second group, it was shown that the highest level of participation in physical activity at the six month follow-up were those participants with the greatest dedication or adherence to their lifestyle physical activity program.